I saw my first Golden Oriole while cycling back after a hard training a couple of days ago. This is one of my favourite birds and it's an absolute pleasure to see one. I might only see one once a year on average and they aren't as common here in the western Algarve as they are in the eastern Algarve where I used to live. 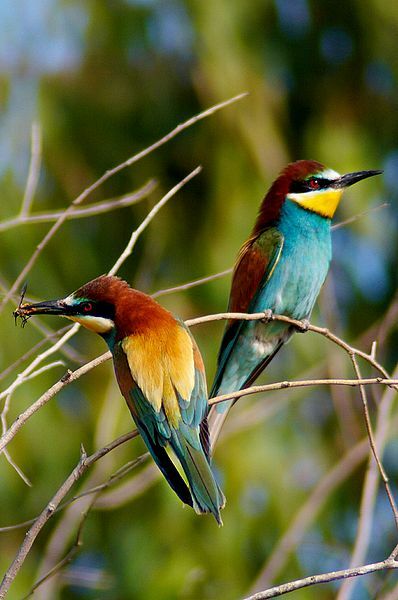 These birds are called "papa figos" in Portuguese, meaning "fig scoffers (slang: eaters)" since they love eating figs. Incidentally figs are in season now... Golden Oriole Right down from the house I saw what must have been the friendliest Hoopoe ever, as it wasn't scared of me and the dog. It was so strange to get so close to such an animal. It was fine, not hurt, so I think it must have been a fledgeling. They are perfectly camouflaged with the ground. Hoopoe The Bee Eaters (with their beautiful song) are in full swing catching all the flying insects and at night there's a Nightjar croaking in the woods. Incidentally, if you're ever lucky enough to see a Night Jar they are very beautiful, a very unusual flight (nearly like a butterfly). Bee eaters http://www.youtube.com/watch?v=j73uN80mML8 Nightjar flight -unmistakeable Speaking of night birds, on the way back from a festival there was an Owl in the road. A small, lightly coloured Owl. The Owl wouldn't fly away so I thought there was something wrong with it, so I turned the car around to have a better look. He flew up onto a grape vine and seemed fine. Later he flew up onto a telephone wire and I saw there was infact a pair of Owls. 'Little Owls' or screech Owls there's called. The more common (you'll see many here) is the 'Scoops Owl' is rounder and a bit shorter. Little Owl I saw a bird I didn't recognise too. I think it was Green Woopecker, I'd never seen one, and the thing flew in front of me quickly as I descended a mountain (cycling of course). The features were unmistakeble: a yellow rump and a flash of bright red on the face. Awesome. I often see Greater Woodpecker, which looks completely different being balck and white. 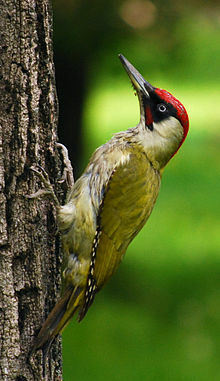 Green Woodpecker in the Algarve is more yellow than green... Finally, something sad, I was having a lie in (sometimes the engine is too broken to get up!) and I was awoken by a terrible croaking. It was an Azure winged Magpie in the living room. What a beautiful creature. I open the door for it an was going to try and get it out, but all of a sudden the thing flew into a window at top speed and broke it's neck, it was sad to have the litte creature then taking it's last breaths in my hand... I was hoping it was just stunned. Oh well. Azure Winged Magpie Have you seen any amazing birds out and about doing sports? Tell me about it! If you'd like to organise a tour in the Algarve with the aim of seeing interesting birds (and cycling of course) then I recommend the 'the skirting the mountains tour'. Remember, If you want something bespoke I can arrange that to with sufficient fore warning.